It taught me a lot about life, that it doesn't always go your way and you have to find happiness in everything you do. Stand tall, hold your hand up high and keep on fighting. I think that's what the Olympics are all about. Dr. Hiroshi G. Okuno was appointed the professor of Speech Media Laboratory, Department of Intelligence Science and Technology, Gradulate School of Informatics, Kyoto Universiton on April 1, 2001. Bio: the same birthday as HAL 9000. "Computational Auditory Scene Analysis" (contents (Eds., Lawrence Erlbaum Associates 1998). Applications of Binary Decision Diagrams. Hiroshi G. Okuno, Kazuhiro Nakadai, Active audition for humanoid robots that can listen to three simultaneous talkers. Journal of the Acoustical Society of America, Vol.113, No.4, Pt.2 of 2, Apr. 2003, pp.2230. Abstract at ASA. Yohei Sakuraba, Hiroshi G. Okuno: Note Recognition of Polyphonic Music by Using Timbre Similarity and Direction Proximity. Proceedings of International Computer Music Conference (ICMC2003), accepted for presentation, Singapore, Oct. 2003. Kazunori Komatani, Shinichi Ueno, Tatsuya Kawahara, Hiroshi G. Okuno: User Modeling in Spoken Dialogue Systems for Flexible Guidance Generation. Proceedings of the Eighth European Conference on Speech Communication and Technology (Eurospeech-2003), accepted for presentation, Geneva, Sep. 2003. Kazushi Ishihara, Yasushi Tsubota, Hiroshi G. Okuno: Automatic Transformation of Environmental Sounds into Sound-Imitation Words Based on Japanese Syllable Structure. Proceedings of the Eighth European Conference on Speech Communication and Technology (Eurospeech-2003), accepted for presentation, Geneva, Sep. 2003. Kazuhiro Nakadai, Daisuke Matsuura, Hiroshi G. Okuno, Hiroshi Tsujino: Three Simultaneous Speech Recognition by Integration of Active Audition and Face Recognition for Humanoid, Proceedings of the Eighth European Conference on Speech Communication and Technology (Eurospeech-2003), accepted for presentation, Geneva, Sep. 2003. Kazunori Komatani, Shinichi Ueno, Tatsuya Kawahara, Hiroshi G. Okuno: Flexible Guidance Generation using User Model in Spoken Dialogue Systems, Proceedings of the 41st Annual Meeting of the Association for Computational Linguistics (ACL 2003), accepted for presentation, Sapporo, Jul. 2003. Taro Watanabe, Eiichiro Sumita, and Hiroshi G. Okuno: Chunk-based statistical translation, Proceedings of the 41st Annual Meeting of the Association for Computational Linguistics (ACL 2003), accepted for presentation, Sapporo, Jul. 2003. Tetsuro Kitahara, Masataka Goto, Hiroshi G. Okuno: Musical Instrument Identification based on F0-dependent Multivariate Normal Distribution. Proceedings of 2003 International Conference on Muotimedia and Expo (ICME 2003), IEEE, accepted for presentation, Baltimore, MD, Jul. 2003. Tetsuro Kitahara, Masataka Goto, Hiroshi G. Okuno: Pitch-dependent Musical Instrument Identification and Its Application to Musical Sound Ontology. In Hinde, C. and Ali, M. (Eds.) Proceedings of Nineteenth International Conference on Industrial and Engineering Applications of Artificial Intelligence and Expert Systems (IEA/AIE-2003), Loughborough, UK, May 2003, Lecture Notes in Artificial Intelligence, Springer-Verlag. Hiroshi G. Okuno, Kazuhiro Nakadai, Hiroaki Kitano: Design and Implementation of Personality of Humanoids in Human Humanoid Non-verbal Interaction. In Hinde, C. and Ali, M. (Eds.) Proceedings of Nineteenth International Conference on Industrial and Engineering Applications of Artificial Intelligence and Expert Systems (IEA/AIE-2003), Loughborough, UK, May 2003, Lecture Notes in Artificial Intelligence, Springer-Verlag. Hiroshi G. Okuno, Kazuhiro Nakadai, Hiroaki Kitano: Realizing Personality in Audio-Visually Triggered Non-verbal Behaviors. Proceedings of IEEE-RAS International Conference on Robots and Automation (ICRA-2003), IEEE, May 2003. Kazuhiro Nakadai, Hiroshi G. Okuno, Hiroaki Kitano: Robot Recognizes Three Simultaneous Speech By Active Audition. Proceedings of IEEE-RAS International Conference on Robots and Automation (ICRA-2003), IEEE, May 2003. Tetsuro Kitahara, Masataka Goto, Hiroshi G. Okuno: Musical Instrument Identification based on F0-dependent Multivariate Normal Distribution. Proceedings of 2003 International Conference on Acoustics, Speech and Signal Processing (ICASSP'2003), Vol.5, pp.421--424, IEEE, Hong Kong, Apr. 2003. Hiroshi G. Okuno, Kazuhiro Nakadai, Tino Lourens, Hiroaki Kitano: Sound and Visual Tracking for Humanoid Robot. Applied Intelligence, Kluwer Publisher, accepted for publication, International Society for Applied Intelligence, 2003. Hiroshi G. Okuno, Kazuhiro Nakadai, Ken'ichi Hidai, Hiroshi Mizoguchi, Hiroaki Kitano: Human-Robot Non-Verbal Interaction Empowered by Real-Time Auditory and Visual Multiple-Talker Tracking Advanced Robotics, Vol.17, No.2, pp.115-130, VSP and Robotics Society of Japan, 2003. Kazuhiro Nakadai, Hiroshi G. Okuno, Hiroaki Kitano: Real-Time Auditory and Visual Multiple-Speaker Tracking For Human-Robot Interaction. Journal of Robotics and Mechatronics, special issue on Human Robot Interaction, Vol.14, No.5 (2002) 479-489, Mechatronics Society of Japan. Yuasa, T. and Okuno, H.G. (Eds. ): Advanced Lisp Technology, Advanced Information Processing Technology, Vol.4, Taylor and Francis Publishers, London, UK, May, 2002. Hiroshi G. Okuno, Kazuhiro Nakadai, Ken'ichi Hidai, Hiroshi Mizoguchi, Hiroaki Kitano: Human-Robot Non-Verbal Interaction Empowered by Real-Time Auditory and Visual Multiple-Talker Tracking Advanced Robotics, in print, Robotics Society of Japan, 2002. Kazuhiro Nakadai, Hiroshi G. Okuno, Hiroaki Kitano: Real-Time Auditory and Visual Multiple-Speaker Tracking For Human-Robot Interaction. Journal of Robotics and Mechatronics, special issue on Human Robot Interaction, in print, Mechatronics Society of Japan, 2002. Kazuhiro Nakadai, Hiroshi G. Okuno, Hiroaki Kitano: Auditory Fovea Based Speech Separation and Its Application to Dialog System. Proceedings of IEEE/RSJ International Conference on Intelligent Robots and Systems (IROS-2002), accepted, IEEE, Geneva, Oct. 2002. Yoko Yamakata, Tatsuya Kawahara, Hiroshi G. Okuno: BELIEF NETWORK BASED DISAMBIGUATION OF OBJECT REFERENCE IN SPOKEN DIALOGUE SYSTEM FOR ROBOT. Proceedings of 2002 International Conference on Spoken Language Processing (ICSLP-2002), 170-176, ASA, ASJ, and ESCA, Denver, Sep. 2002. Kazuhiro Nakadai, Hiroshi G. Okuno, Hiroaki Kitano: AUDITORY FOVEA BASED SPEECH ENCHANCEMENT AND ITS APPLICATION TO HUMAN-ROBOT DIALOG SYSTEM. Proceedings of 2002 International Conference on Spoken Language Processing (ICSLP-2002), 1817-1820, ASA, ASJ, and ESCA, Denver, Sep. 2002. Kazunori Komatani, Tatsuya Kawahara, Ryosuke Ito, Hiroshi G. Okuno: Efficient Dialogue Strategy to Find Users' Intended Items from Information Query Results, Proceedings of the Nineteenth International Conference on Computational Linguistics (Coling-2002), 481-487, Aug. 2002. Yoko Yamakata, Tatsuya Kawahara, Hiroshi G. Okuno: Belief Network based Disambiguation of Word Reference in Spoken Dialogue System for Robot. Proceedings of ISCA Tutorial and Research Workshop on Multi-Modal Dialogue in Mobile Environments, Germany, Jun. 2002. Hiroshi G. Okuno, Kazuhiro Nakadai, Lourens, T., Hiroaki Kitano: Sound and Visual Tracking by Active Audition, Q. Jin, J. Li, N. Zhang, J. Cheng, C.Yu, S. Noguchi (Eds.) Enabling Society with Information Technology, pp.174-185, Springer-Verlag, Tokyo, Jan. 2002. Takamichi Saito, Kentaro Umesawa, Hiroshi G. Okuno: プライバシーを重視するアクセス制御システムの一方式. Transaction of IEICE, Vol.D1, IEICE, Dec. 2001. Lourens, T., Kazuhiro Nakadai, Hiroshi G. Okuno, Hiroaki Kitano: Detection of Oriented Repetitive Alternating Patterns in Color Images --- A Computational Model of Monkey Grating Cells. Proc. of Sixth International Work-Conference on Artificial and Natural Neural Networks (IWANN2001), Lecture Notes in Artificial Intelligence, No.2084, 95-107, Springer-Verlag. Granada, Spain, June 2001. Frank, I., Kumiko Ishii-Tanaka, Hiroshi G. Okuno, Junichi Akita, Yukiko Nakagawa, K. Maeda, Kazuhiro Nakadai, Hiroaki Kitano: And The Fans are Going Wild! SIG plus MIKE. RoboCup 2000: Robot Soccer World Cup IV, Lecture Notes in Artificial Intelligence No.2019, 139-148, Springer-Verlag, May 2001. Yukiko Nakagawa, Hiroshi G. Okuno, Hiroaki Kitano: Bridging gap between small sized league and simulator league. RoboCup 2000: Robot Soccer World Cup IV, Lecture Notes in Artificial Intelligence No.2019, 209-218, Springer-Verlag, May 2001. 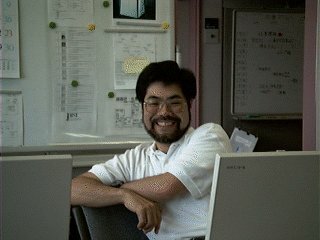 Hiroaki Kitano: Hiroshi G. Okuno, Mineo Morohashi, Koji Kyoda, Kazuhiro Nakadai (Translation): "How to Build a PC Cluster - Linux cluster Beowulf", Sangyo-Tosho, March, 2001. Kazuhiro Nakadai, Ken-ichi Hidai, Hiroshi Mizoguchi, Hiroshi G. Okuno, Hiroaki Kitano: Real-time Multiple Person Tracking by Face Recognition and Active Audition. SIG-Challenge-01-5, pp.27-34, JSAI, Mar. 2001. Hiroaki Kitano, Hiroshi G. Okuno, Kazuhiro Nakadai, Theo Sabische, Tatsuya Matsui, Design and Architecture of SIG the Humanoid: An Experiemntal Platformfor Integratind Perception in RoboCup Humanoid Challenge. Proc. of IEEE/RSJ International Conference on Intelligent Robots and Systems (IROS-2000), 181--190, Takamatsu, Nov. 2000. Iris Fermin, Hiroshi Ishiguro, Hiroshi G. Okuno, Hiroaki Kitano: A Framework for Integrating Sensory Information in a Humanoid Robot. Proc. of IEEE/RSJ International Conference on Intelligent Robots and Systems (IROS-2000), 1748--1753, Takamatsu, Nov. 2000. Hiroshi G. Okuno: Computational Auditory Scene Analysis --- Toward the Recognition of a Mixture of Sounds", Joho Shori, 1096--1101, IPSJ, Oct. 2000. Lourens, T., Kazuhiro Nakadai, Hiroshi G. Okuno, Hiroaki Kitano: Selective Attention by Integration of Vision and Audition. Proc. of First IEEE-RAS International Conference on Humanoid Robots (Humanoids2000), Cambridge, Sep. 2000. Frank, I., Kumiko Ishii-Tanaka, Hiroshi G. Okuno, Kazuhiro Nakadai, Yukiko Nakagawa, K. Maeda, Hiroaki Kitano: And The Fans are Going Wild! SIG plus MIKE. Proc. of the Fourth Workshop on RoboCup (RoboCup-2000), 267--276, RoboCup, Melbourne, Aug. 2000. Yukiko Nakagawa, Hiroshi G. Okuno, Hiroaki Kitano: Bridging gap between small sized league and simulator league. Proc. of the Fourth Workshop on RoboCup (RoboCup-2000), 1--10, RoboCup, Melbourne, Aug. 2000. Hiroshi G. Okuno, Koji Kyoda, Mineo Morohashi, Hiroaki Kitano: Initial Assessment of ERATO-1 Beowulf-Class Cluster. Ito, T. and Yuasa, T. (eds.) Parallel and Distributed Computing in Symbolic and Irregular Applications, World Scientific Publishing, 372-383, 2000. Tomohiro Nakatani, Hiroshi G. Okuno: "Sound ontology based integration of Computational Auditory Scene Analysis Systems", Journal of Japanese Society for Artificial Intelligence, Vol.14, No.6 (Dec. 1999) (in press). Hiroshi G. Okuno, Koji M. Kyoda, Mineo Morohashi, Hiroaki Kitano: "Initial Assessment of ERATO-1 Beowulf-class Cluster" Proc. of International Symposium on Parallel and Distributed Processing for Symbolic and Irregular Applications", Sendai, July, 1999. Hiroshi G. Okuno, Tomohiro Nakatani, Takeshi Kawabata: "Listening to Two Simultaneous Speeches", Speech Communcations, Vol.27, Nos.3-4 (Apr. 1999), pp.299-310, Elsevier, 1999. Tomohiro Nakatani, Hiroshi G. Okuno: "Harmonic Sound Stream Segregation Using Localization and Its Application to Speech Stream Segregation", Speech Communcations, Vol.27, Nos.3-4 (Apr. 1999), pp.209-222, Elsevier, 1999. Takahide Hoshide, Masayoshi Nose, Hisazumi Tsuchida, Kisaku Fujimoto, and Hiroshi G. Okuno: "Adaptive realtime planning for multi-media communication services by multi-agent system", Transaction of Institute of Electronics, Information and Communication Engineers, B-I Vol.J81, No.7 (July 1998) pp.440-449. Osamu Akashi, Ken'ichiro Murakami, Yoshiji Amagai, and Hiroshi G. Okuno: "NueLinda Model and Its implementation by self-description", Computer Software, Japanese Society for Software Science and Technology, Iwanami Publisher, Vol.14, No.1 (Jan. 1998) pp.24-33. Hiroshi G. Okuno: "Invitation to Computational Auditory Scene Analysis Research", Journal of Japanese Society for Artificial Intelligence, Vol.13, No.1 (Jan. 1998) pp.45-46. Hiroshi G. Okuno, Katashi Nagao, Yoshiyuki Koseki, Hiroshi Yasuhara, and Ken'ichi Yoshida: "Stand-alone and Open-ended Collection of Papers with Retrieval Capability --- Experience with JSAI 10th Anniversary Commemorative CD-ROM ---" Journal of Japanese Society for Artificial Intelligence, Vol.12, No.6 (Nov. 1997) pp.911-920. Takahide Hoshide, Masayoshi Nose, Hisazumi Tsuchida, and Hiroshi G. Okuno: "Adaptive and real-time planning architecture in IDSP system", NTT R & D, Vol.46, No.11 (Nov. 1997) pp.1257-1264. Hiroshi G. Okuno, Tomohiro Nakatani, and Takeshi Kawabata: "Challenge Problem: Understanding Three Simultaneous Speakers", Proc. of the 15th International Joint Conference on Artificial Intelligence (IJCAI-97), Vol.1, pp.30-35, IJCAI, Nagoya, Aug. 1997. Hiroshi G. Okuno, and Tomohiro Nakatani: "Sound Stream Segregation by Multiagent System", System/Infomation/Control, Journal of the Institute of Systems, Control and Information Engineers, Vol.41, No.8 (Aug. 1997) pp.309-315. Hiroshi G. Okuno, Tomohiro Nakatani, and Takeshi Kawabata: "Speech Stream Segregation and Preliminary Results on Listening to Several Speeches Simultaneously", Transaction of Information Processing Society of Japan, Vol.38, No.3 (Mar. 1997) pp.510-523. Tomohiro Nakatani, Masataka Goto, Takeshi Kawabata, and Hiroshi G. Okuno: "Proposal of Residue-Driven Architectureand Its application to for Sound Stream Segregation", Journal of Japanese Society for Artificial Intelligence, Vol.12, No.1 (Jan. 1997) pp.111-120. Hiroto Masaki, Itsuro Saito, Mitsuru Ishizuka, and Hiroshi G. Okuno: "Efficient Understanding of Three Orthographic Views Using Binary Decision Diagram", Transaction of Information Processing Society of Japan, Vol.37, No.11 (Nov. 1996) pp.1969-1979. Tomohiro Nakatani, Masataka Goto, and Hiroshi G. Okuno: "Localization by harmonic structure and its application to harmonic sound stream segregation." Proceedings of 1996 International Conference on Acoustics, Speech and Signal Processing (ICASSP-96), Vol II:653--656, IEEE, Atlanta, U.S.A., May 1996. Hiroshi G. Okuno, Osamu Shimokuni, and Hidehiko Tanaka: "Binary Decision Diagram based Multipli-Context type Truth Maintenance System BMTMS", Journal of Japanese Association for Artificial Intelligence, , Vol.11, No.3 (Mar. 1996) pp.280-289. Abstract. "Multi-Agent and Cooperative Computations III" (ed., Kindai-Kagaku Sha,, 1994). "Computational Auditory Scene Analysis" contents (Eds. D. Rosenthal and H. G. Okuno, Lawrence Erlbaum Associates 1998). "Utliziing the Internet" (Iwamani Science Library No.44, Iwanami Publisher , 1996). Japanese Association for Artificial Intelligence, Special Interest Group on Artificial Intelligence Challenges (former SIG on Parallel Processing and Hot Topics for Artificial Intelligence). Stanford University Computer Sciene Department Knowledge Systems Lab. Department of Electonic Engineering , Faculty of Engineering, The University of Tokyo. Kitano Symbiotic Systems Project, ERATO, Japan Science and Technology Corporation. Copyleft All Wrongs Reserved, 1992-2011.